I was sitting in a plastic chair at the hotel pool, watching my friend’s kids as they splashed and jumped and played in the water. The scene could best be described as enjoyable chaos. The little boys would yell, “Sabrina! Look at me, I can do such-and-such like this!”, and then proceed to fearlessly leap into the deep end, or cannon-ball into the shallow end, or hold their breath for as long as they could underwater. In the midst of all of this, their 4 year old sister was carefully and cautiously testing the water on her own. Her mom was close by, watching over her, but she would weigh her options of clinging to the pool wall or allowing her mom to carry her through the water where her feet couldn’t touch. The little girl was much more inclined to stay close to the wall, where she was completely in control and able to touch the bottom with her toes – while holding tightly to the cement lip of the pool – rather than allowing her mom to carry her into the deeper water. And it hit me that I tend to do the very same thing. To truly let go is to truly trust. We too easily throw out “Christian lingo” into situations, like “Let go, let God!” and don’t actual believe what we’re saying. There is no 5-step plan to figure out what real peace and trust and rest looks or feels like. Because when you finally reach the breaking point…when your fingers are slipping from the wall and your feet hurt from straining to touch the floor…THAT’S when you know. That’s when His arms wrap around you and you find yourself at ease with where He’s leading you. Let your Heavenly Father carry you through those deep unknowns. 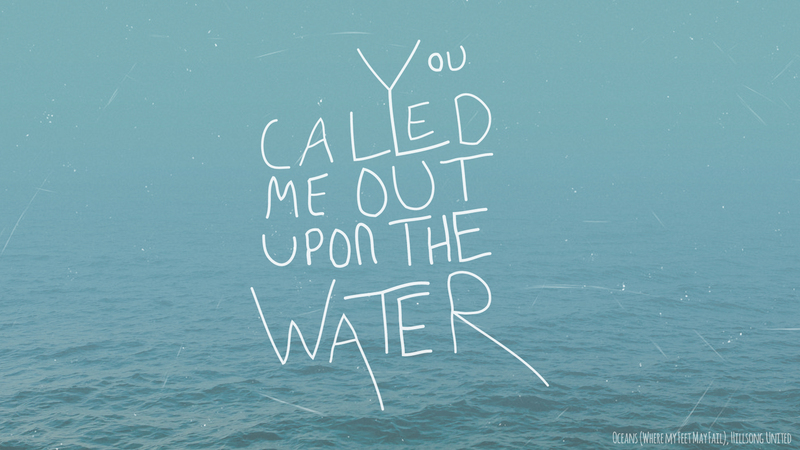 He won’t ever let you drown! What a powerful yet simple illustration of how we are to trust God! I have been like the little girl at times, afraid to let go and fully trust God but I want to be like the boys who jumped in the water without fear ALL the time! Thanks for sharing….. Thanks for the feedback, Rolain! Agreed, we have to find the courage in Christ to leap fearlessly into whatever He’s calling us to. Such a freeing thing, once we find the strength to let go and act on it!